· Quick access to specific CRM information related to this Contact (Journals, Tasks, Appointments, etc.). 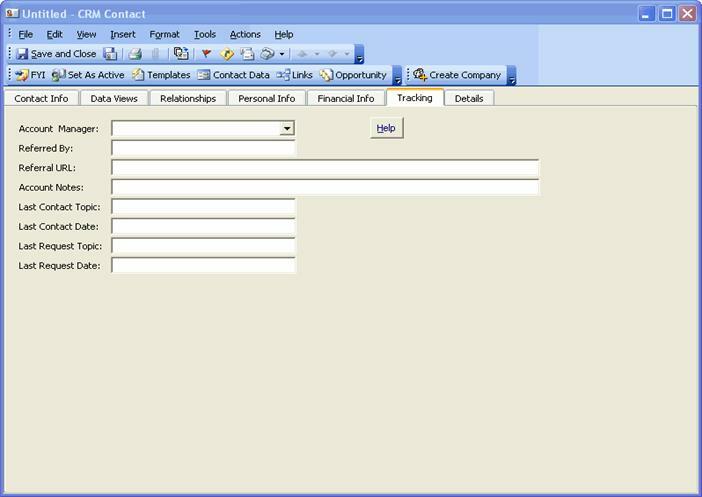 · Filter the displayed list by this Contact or the linked Contact’s Company. (Ex. Clicking “Calendar” will display all Appointments related to this Contact). · Establish unique relationships between your CRM Contact records. · Picker button makes finding and selecting the contact easy and quick. · View the related CRM Contact by clicking the contact link. · Define the type of relationship between this contact and the linked contact . · This “Tracking” tab is provide here on the Extensions Contact form for compatibility with the standard CRM Contact form. · Can be used just as you have used this tab with your personal Outlook Contacts. · Links to standard Financial management documents provided with date of last update (field labels become hyperlinks after documents have been linked). Buttons for “New”, “Copy”, “Delete” provide quick and easy management of Portfolios from this Contact form. 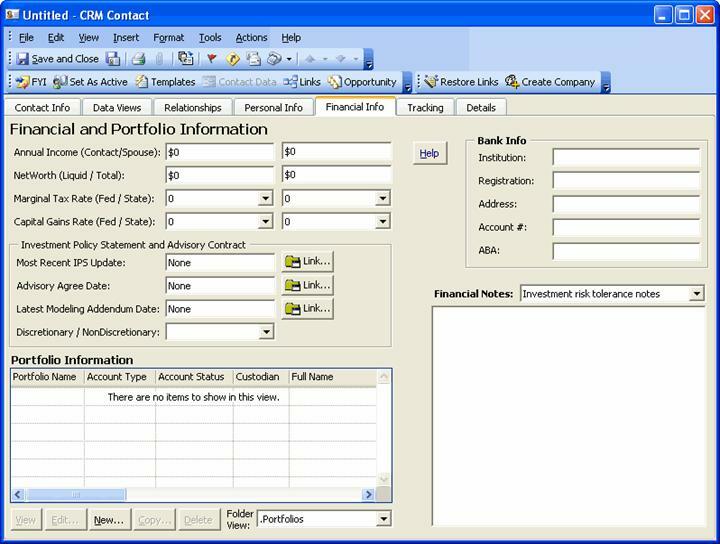 Any Portfolio form fields may be displayed on this grid view, with sorting and folder type grouping. · Essential “Bank Information” fields provide quick reference for your financial transactions. · “Financial Notes” support many different user defined notes that are specific to recording the “Financial” aspects of your clients. 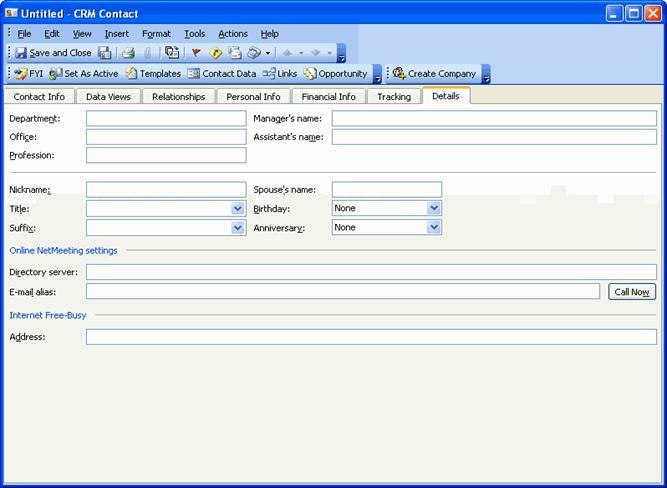 · “CRM Functions” options are set on the CRM Options “*Extensions Financial” tab. · “Personal Info Notes” support many different user defined notes that are specific to your information needs with your clients / customers. 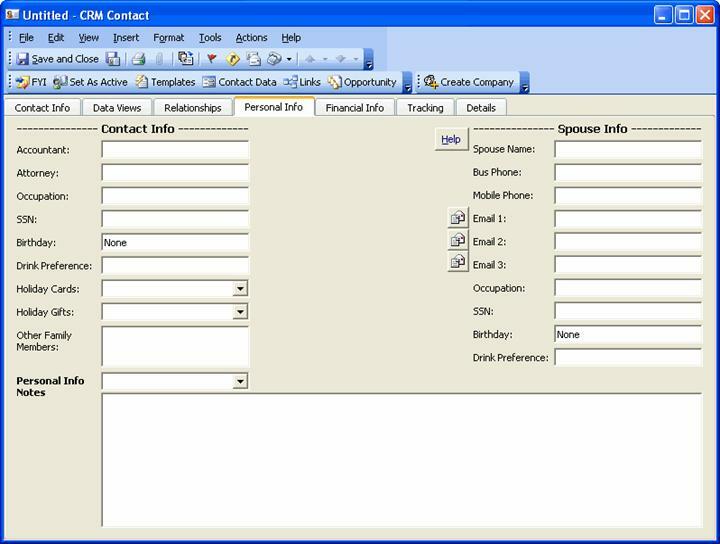 · Spouse information fields are available to enable better interactions with your clients. · E-mail sent (using either of the 3 buttons pictured above) to the spouse will be Journaled to this CRM Contact.